Bikes are vehicles of freedom. Bikes are a free ride with the wind blowing through your hair, the sun warming your skin and the sight of roads or trails yours to explore. Ride to school without waiting for the bus. Ride downtown to visit the museum. Is the ride too far? Strap it to the front of the city bus or take it on the train. Do you need to go grocery shopping? No problem! Carry your items in your backpack, put them in a basket or on a trailer. Riding your bicycle will cut down on energy use, save you money and help the environment. Since their first invention in 1817, bikes have been called ‘hobby horses’, ‘fast foot’ and ‘two wheelers’. Today cities all over the world are filled with bikers. Bikes reduce automobile traffic, carbon dioxide emissions, gas usage, and keep money in your pocket! Some cities, like Paris, have bikes for rent around every street corner; pick up a bike, ride across town, leave the bike there. Other Cities like Hong Kong and Beijing have pedicabs or rickshaws. Biking is also a great form of exercise! Exercise reduces weight and helps to cut stress. Riding your bike gives you time to think and to see your city. Why not take a ride today? Watch the Cyclemon Experiment. A bike can be a very personal and valuable possession. Many people customize their bikes to fit their personalities as well as their performance needs. What do you use your bike for? Riding to work, shopping, going to the beach, exercise or fun? If you are transporting things, what do you need to carry and how would you do that on your bike in a safe and comfortable manner? Begin by drawing a picture of your bike. It can be a flat drawing or one in perspective. 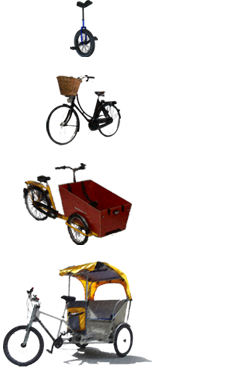 Next, make a list of the things you need to add to you bike and then draw them where they will be attached. Is it a basket? What color will you make it? What is the pattern of the basket weaving? Are there designs of animals woven into the wire? How about lights? Design and draw a new shape for your light. Is it a streamlined or big and wide to flood the street in front of you? Record your list and your drawings in your journal so you can communicate your ideas to your friends. How do they use their bikes and what ideas did they come up with? Discover what will fit your needs and comfort. 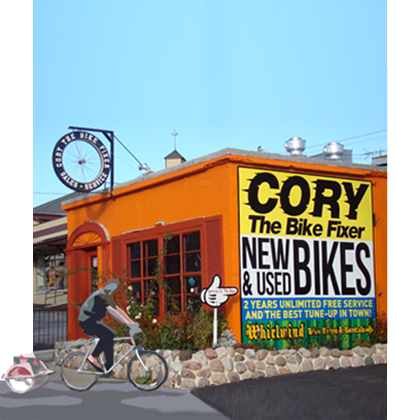 Go to your local bike shop and look around! Many people don’t feel safe biking because of the risk they face on busy streets. Many cities have a bicycle federation that publishes a map of all of the bike trails. Find a map of your neighborhood on-line or in a book. First, locate your home as a starting point and find destinations you want to travel to, like a friend’s house, a park, a movie theater or a restaurant. On the map, wider streets are usually the busiest and smaller ones are usually quieter and safer for a bicycle. What streets would you take and why? Would it be safer to simply walk your bike in a high traffic area? How many busy streets will you have to cross and where would you take public transportation? Map out a new and safe bicycle route. Design places where you would like to add a bicycle lane on the road and where would you like a bike trail to be. Design a bike route based on your discoveries! Remember, all maps start by wearing a bike helmet! Check out one of the world’s most famous bike races- the Tour de France. To encourage others to choose a bike ride over a drive in the car, you will design a bike rack that catches your community’s imagination. 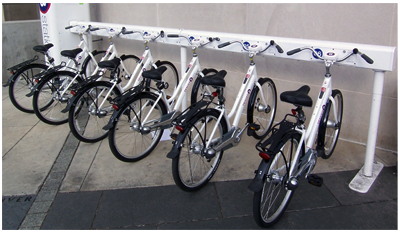 First, investigate the bike racks in your neighborhood and around your town. What do they have in common? Are they sturdy, resistant to the weather and use, and conveniently located? How many bikes can they hold? Next, find a place in your community that needs a new bike rack. This could be close to a park, a school or a store. Talk to bikers. Ask them where they like to lock their bikes. Watch bikers lock up their bikes at different bike racks and record the positive and negative aspects of each rack type. 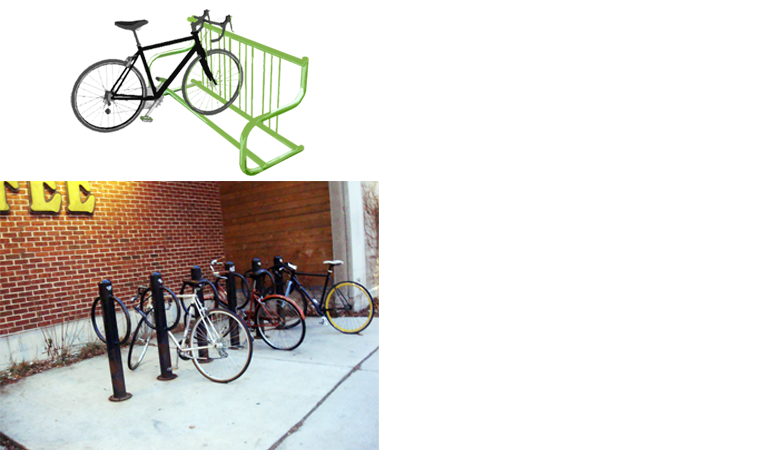 Create three images of your new bike rack. Will the bike rack look like it is in motion or very strong and stationary? Consider what the bike rack will be made of and how it would stand up and how it would be attached to the ground. Think about how the bike will be locked to the rack. Make certain that it will be easy to lock up but secure enough to hold the bike in place. Choose the best design of the three and draw your new bike rack in plan and in elevation in your journal. Cut a bike out of a catalogue and show how a bike can be locked up to your design. Label the materials that you will use to construct it. Make a place for bikes! Biking saves money and uses less energy. Check out one of the bike commuting calculators on page c to see how much someone in your family could save by riding a bike to work or to the grocery store. Figure out how much you could save your family if you biked to school instead of riding in a car every day. In the city of Amsterdam, one half of the traffic movements are by bike. There are even bike garages! Biking is efficient, healthy, and environmentally friendly. Biking makes sense! What is the fasted recorded speed of a human on bicycle? Name three hand signals that every bicyclist should know. Which of the following is the most important safety feature on a bike? The first bicycles were made from steel tubing. What kind of materials do they use today? Paris Share A Bike Program!